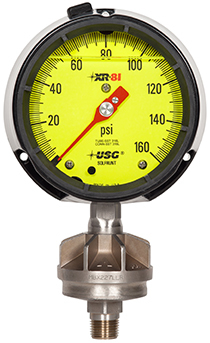 The XR-Series starts with a Model 1981 process gauge and welds that to a XR diaphragm seal. All the components of the diaphragm seal are welded together internally and the seal is welded to the socket of the pressure gauge. This eliminates any leak paths traditionally found in a threaded pressure gauge and diaphragm seal combination.